Two men have been taken to hospital, suffering from cuts, after an incident outside a fast food restaurant. 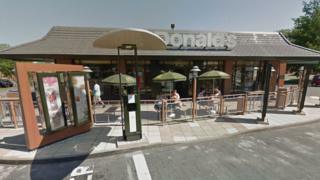 Police were called to McDonald's in Emery Road, Bristol, at about 20:25 GMT on Friday, after reports of a disturbance. A 16-year-old boy was arrested on suspicion of wounding, Avon and Somerset Police said.